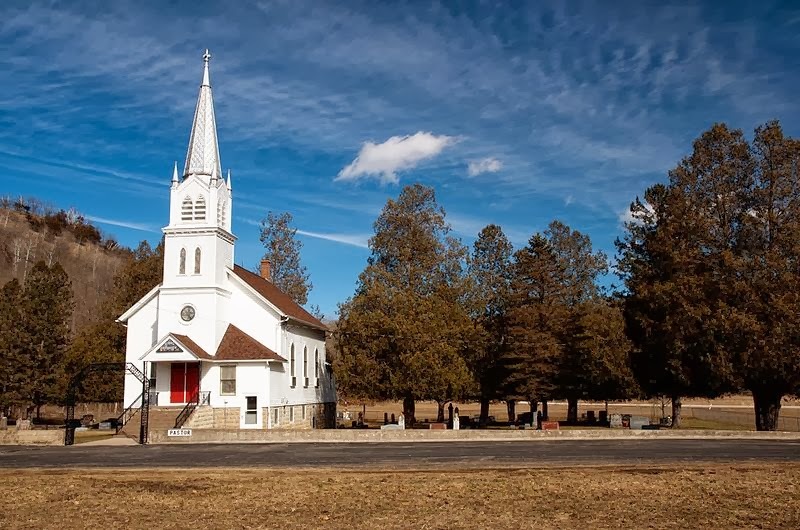 Cross Encounters: Why I Number Myself Among "The 15"
Why I Number Myself Among "The 15"
Pastor Tom Chantry of Christ Reformed Baptist Church (Milwaukee) summed it up well. "'The 15' is not akin to a silly boycott of a secular company; it is an uprising of serious churchmen calling for ecclesiastical action." 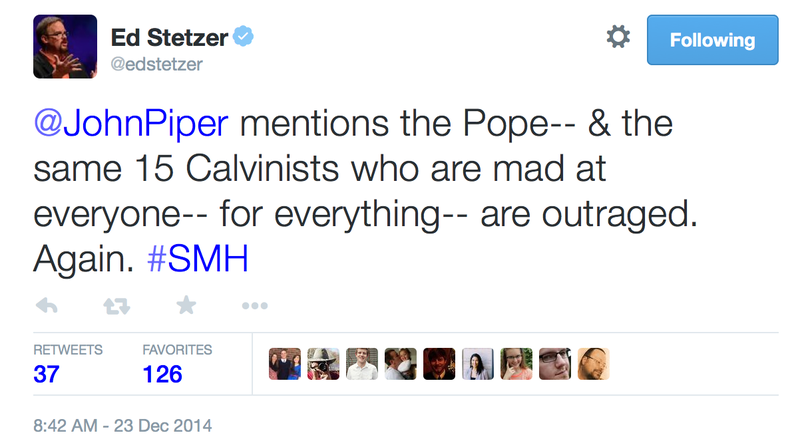 Stetzer followed up his shot against the "same 15 Calvinists" with this, this, this, and this. Hall soon followed the inaugural tweet with an article titled, "Who are #the15," on the Pulpit and Pen blog. Please read Hall's article for the best explanation, for the original intent of #The15. 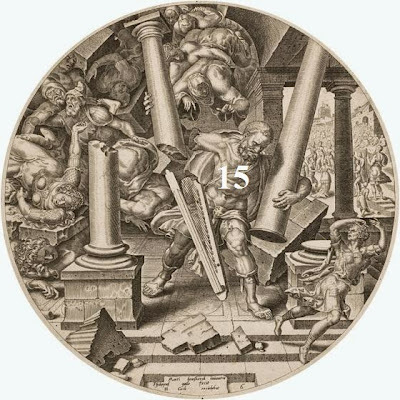 The above picture is of a 16th century engraving by Philips Galle titled, "Samson Destroying the Temple of the Philistines." For the record, the "15" on Samson's chest is my personal touch. According to the biblical record, there is no evidence that Samson ever wore a jersey with the number 15 on the front. As I thought of the tragic yet redemptive end of Samson's life (Judges 16:25-30), I thought of what #The15 represents (cue the melodramatic music). I see the Philistine temple the same way I see American Evangelicalism. Both are godless structures. I see Samson the same way I see the Bride of Christ. As Samson stood within the Philistine temple determined to bring it to the ground, within the godless system of American Evangelicalism is the Bride of Christ, fighting for the truth of God's Word, the fidelity of the gospel, and the purity of the Church. One day (and I hope it is soon) Jesus Christ will use His Bride, the Church, to bring down, to utterly destroy, the temple of quasi-Christianity commonly referred to as American Evangelicalism. Oh, it won't be violent. It won't be a hostile takeover. 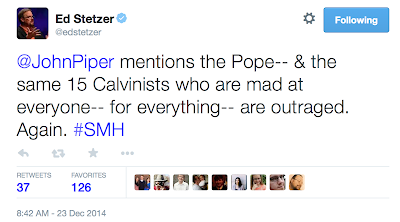 American Evangelicalism will simply burn up like every other piece of chaff. The tare that is American Evangelicalism will be uprooted, without harming the wheat (God's people). 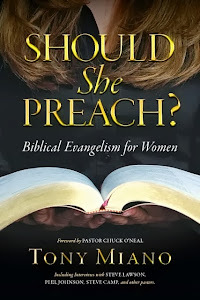 And how will God use His Bride to accomplish the destruction of American Evangelicalism? No, it won't be the persecution of American Evangelicals at the hands of true Christians. It will be the other way around. The Bride of Christ will, I believe, soon be persecuted by those who would number themselves among the American Evangelical ranks before they would ever dream of counting the cost of following Christ. It won't be long (again this is simply my belief; I don't even play a prophet on television) before American Evangelicals, because of their love of the world and the things of the world, because of their desire to be loved by the world and the people of godless religions and political systems, will begin to side with the popes, pundits, and politicians of the world against the Bride of Christ. It will be the persecution of the true saints of God, which will include the blood of martyrs, at the hands of people (American Evangelicals) who have created a Jesus in their imagination--a socially relevant, all-inclusive, gentlemanly, demonic Jesus--that will be used of God to separate the tares from the wheat, to separate the Bride of Christ from American Evangelicalism. While American Evangelicalism is awash with everything God hates--from abortion to divorce, to homosexuality, to sexual predator pastors, to pluralism, to greed, to unbiblical tolerance, to false prophets and teachers, and so on--the Bride of Christ that finds herself within this depraved and debaucherous system is beautiful. While yet imperfect, she is set apart to God, for the Son, by the Holy Spirit. And the Bridegroom will one-day rescue His Bride from this fallen world and the fallen religious system known as American Evangelicalism. I number myself among #The15 because I see American Evangelicalism (not all evangelicals) as an enemy of Christ. I see American Evangelicalism as a tool of Satan to fill Hell with Matthew 7:21-23 false converts. I see American Evangelicalism as a demonic system that gives people what they want, a wide gate into what they think is heaven. Yet all-the-while they are strolling on an easy religious path that leads to destruction. I number myself among #The15 because I don't want people to go to hell while thinking they are on the fast track to heaven. There is no group of people for whom I fear, worry, and weep more than false converts--people who think they will stand before Christ and say, "Lord! Lord!" They will say it only to hear Jesus say in response, "Depart from me." Why do I number myself among #The15? I do so because I love Jesus, His Church, and the lost more than any religious system that blasphemes the first, sullies the second, and damns the third. Well said, brother. My thoughts exactly. This isn't a silly boycott. It's a confrontation of that which obscures the gospel, diminishes our view of the glory of God, & hinders souls from seeing their need for Christ. 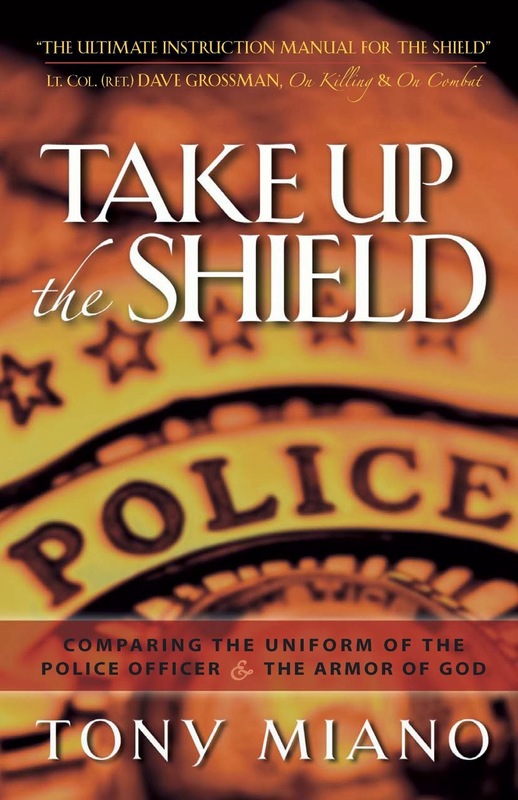 Mall Evangelism: "I Want to Talk about God"
Suicide Behind the Badge: Wait! There's Hope!